On display in the Georgian interiors downstairs at Abbot Hall is a selection of works by George Romney (1734-1802), one of the greatest of all eighteenth-century portrait painters. Starting in the Dining Room, Romney’s early career in Kendal is described through paintings that show him developing his style and growing in confidence as an independent artist: from the beautiful colouration and awkward elegance of his early full length portraits, through to the experimental light effects of The Artist’s Brother James Holding a Candle (1761) and his grand Shakespearean ‘history’ painting, King Lear in the tempest tearing off his Robes (1762). Romney moved to London in 1762, leaving his wife and children behind, and pursued a career that saw him rise to become one of the most celebrated and fashionable portraitists of his age. There is no better setting than the red silk-lined walls of Abbot Hall’s Saloon in which to view some of the paintings that helped make Romney’s name. 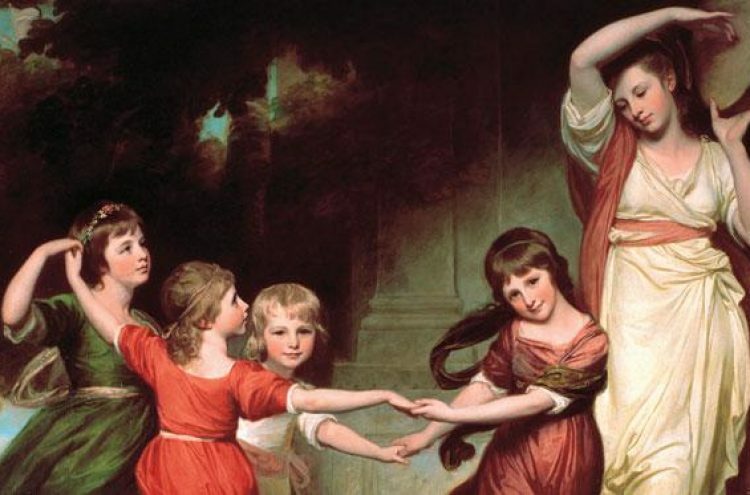 The centrepiece is what many perceive to be his masterpiece: the huge The Gower Family: The Children of Granville, 2nd Earl Gower (1776-7), with its sense of informality and dynamic composition forging a style of portraiture that Romney’s contemporaries were soon imitating. By the time of his brilliantly loose and captivating painting of Emma Hart as Miranda (1785-6) and other portraits of the 1780s and 90s, Romney’s technical prowess is clear to see – confident sweeps of paint and strokes of colour that would give the Impressionists a run for their money. Overseeing this grand display of masterpieces is George Romney himself, peeking out from one of his very last great paintings, The Four Friends (1796).